DEBORAH CROMBIE: There's nothing we love more here at Jungle Red Writers than welcoming one of our regular commenters to the blog.And what is so fascinating is that we bring so many different places and perspectives to this community. I was so pleased to learn more about Keenan Powell, who we see often in these pages, and her books. Her debut novel, DEADLY SOLUTION, was just nominated for a Lefty (the awards given by the Left Coast Crime conference) for Best Debut Novel. So huge congrats from all of your cheerleaders here!! And we are also celebrating the release of Keenan's second Maeve Malloy novel, HEMLOCK NEEDLE! Here's Keenan to tell you more about it. Thanks so much, Reds, for having me on your blog today. I don’t always comment, but I follow Jungle Reds. You are a bright spot. I’m super excited about the release of my second Maeve Malloy Mystery, HEMLOCK NEEDLE. It was born from a nagging inspiration: a newspaper photograph of a little Yup’ik boy sitting on his haunches behind a forest of adult legs during a Starring ceremony. Although they were indoors, he was wearing his winter coat and he looked uncomfortably warm and I thought to myself, I bet someone told him not to take the coat off because he might lose it. 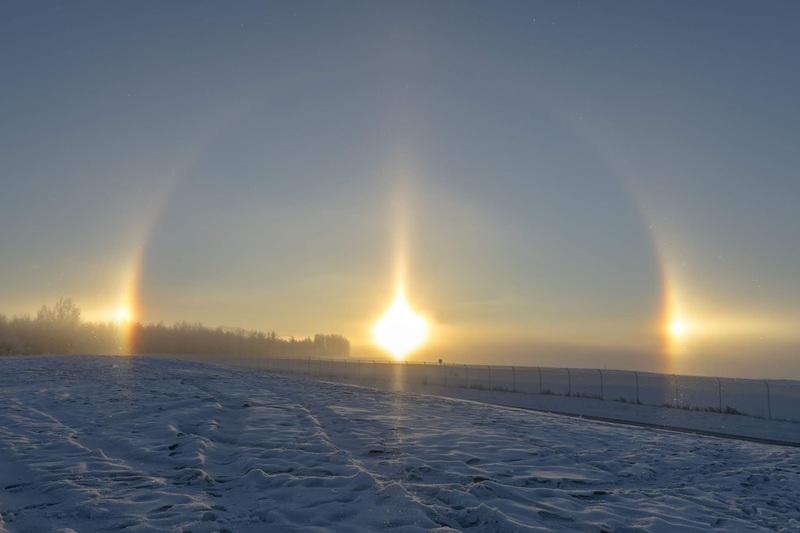 The Starring ceremony is a Russian Orthodox Christmas celebration. In the villages, people go from house to house spinning huge tinsel stars and singing Christmas carols in Russian, English, and their Native language. Then there is food and drink and then the party moves on to the next house. In Anchorage, the party takes place at the Alaska Native Medical Center where a large room is set aside for gatherings. That is where the picture was taken. What intrigued me about this little Yup’ik boy was how he was caught in the middle of a cultural tsunami: hundreds of miles away from his ancestral home, celebrating Christmas with friends and relatives but also Alaska Natives who had been traditional enemies, altogether in in an essentially foreign city, and he would grow up during an era when his people were fighting to preserve their culture and way of life. That image was front and center in my mind and I felt like I was never going to get past it unless I gave it a story. So here’s the story that evolved: In Anchorage, Alaska, Yup’ik Eskimo chief financial officer and single mother, Esther Fancyboy, walks out of a party and into a blizzard. 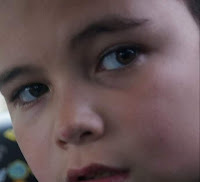 She is never seen again, leaving behind a seven-year-old son, Evan. The local cops say she’ll come home when she’s done partying, but family friend Maeve Malloy doesn’t think it’s that simple. She goes looking for Esther just as she’s getting bad news of her own, a career-ending accusation. When Esther’s body turns up in a snow berm and a witness is shot to death in front of Maeve, she suspects Evan might be in danger. Maeve must race against time to save the boy – along with her career, and maybe her life. Since I have practiced law in Alaska for over thirty-five years, I was able to draw on my experience working with Yup’ik people. One time, I watched a white politician give a speech to a roomful of villagers on the topic of subsistence lifestyle (politician against). On another occasion, I visited fish camp near the village of Kwethluk when I was working on a fishing right case and I was struck by how joyous the folks were as they worked by the riverside. In particular I remember one man who walked gracefully across a rocking boat onto the beach, his body reacting instinctively to the gentle movement of the river beneath his feet, having spent his life on that river. And for what I didn’t know, I lucked out. My grandchildren’s other grandmother is Yup’ik from Eek, Alaska. She advised in particular on a birthday gift that my character Esther had been making for her own grandmother when she disappeared. It was her opinion that my Esther was a good Yup’ik girl. 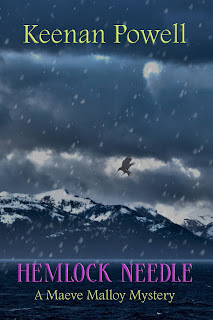 In celebration of my release, I’d like to give away a copy of HEMLOCK NEEDLE to a commenter. Is there an image in your head that refused to go away? Did you do something with it? Paint, draw, music, wrote, made up a little story, told your best friend about it over coffee? Or, tell us about your grandmother or your grandkids. You can order HEMLOCK NEEDLE here. DEBS: Don't tempt me on the granddaughter or my grandmother! But I am so curious about Alaska, and the culture you've portrayed so vividly for us here, Keenan. AND I want to know what happened to Esther, and to Evan. Keenan’s first publication was illustrations in Dungeons and Dragons, 1st edition, drawn the summer before finishing high school. Art seemed to be an impractical pursuit – she wasn’t an heiress, didn’t have the disposition to marry well, and hated teaching – so she went to law school instead. The day after graduation, she moved to Alaska. 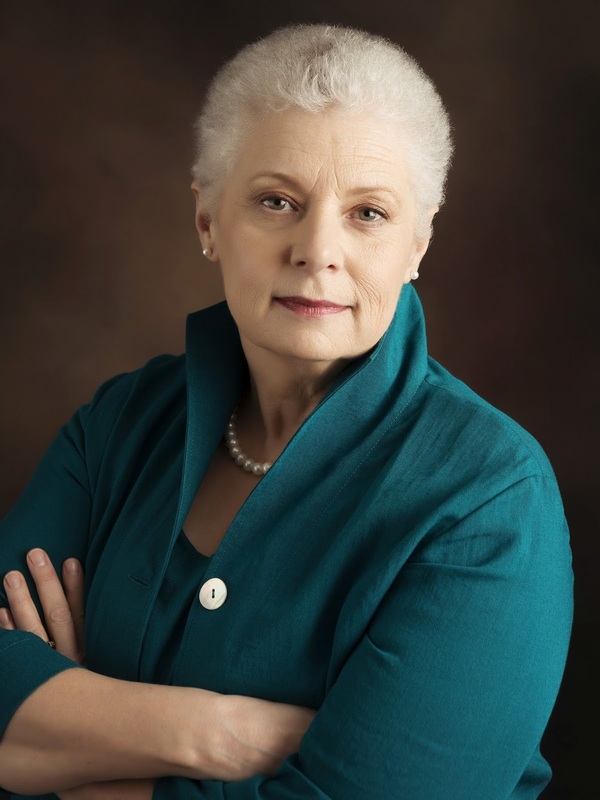 She practiced criminal defense for many years, taking on a wide-range of cases all the way from murder to Alaska Native fishing and hunting rights. She continues to practice law in Anchorage, Alaska. She was one of the 2015 recipients of William F. Deeck-Malice Domestic grant, currently writes a legal column, Ipso Facto, for the Guppies’ newsletter, First Draft, and blogs with Mysteristas. Her first Maeve Malloy Mystery, DEADLY SOLUTION, has been nominated by Left Coast Crime for best debut. Visit her at www.keenanpowellauthor.com where you can learn more about her writing, about Alaska, and sign up for her newsletter. Congratulations, Keenan, on your award nomination and on your newest book. I’m looking forward to meeting Maeve in the pages of your story and finding out just what happens to Evan . . . . I could write pages about my delightful grandbabies and my wonderfully independent, and much-missed no-nonsense grandmother, but, like Debs, I’d really like to hear more about Alaska and what led you to make your home there . . . . Thanks, Joan. I grew up an Air Force brat so I wasn't attached to a particular place when I graduated law school in California which at the time was going through a small recession and none of my classmates were finding jobs. So I looked for a new place to go. I came up to visit a high school friend and the moment I got off the plane and saw this little city nestled against a rim of mountains, I found it. That was 37 years ago. Applauding applauding applauding! So pleased and happy for you—Congratulations! I always think about you, in Alaska, and marvel at your bravery. (How many earthquakes have you had in the past two weeks or so?) You are amazing! Thank you, thank you, and thank you! For everything and all that you do for new writers and the genre. To answer your question, we have had 51 quakes over 3.0 in the past 14 days. There are quakes under 3.0 all the time but usually I don't notice those. I even miss some of the 3s now, less sensitive to them which is nice. I was getting a bit shell shocked there for while and so was everyone else. Congratulations, Keenan! Fascinating story about the inspiration for your newest work! Thanks, Jess. I'm learning inspiration is everywhere if you become sensitive to it, which I endeavor. This particular story would not let me go. Congratulations! I loved pretty much everything about your bio, but especially your reasons for attending law school. No image that has haunted me to report, and no grandchildren yet. I grew up knowing only my paternal grandmother, who was in many ways a larger-than-life figure. My direct memories of her are quite warm and fuzzy, but as an adult I have heard a lot of additional stories that reflect a much more complex character. Nya ya ya! I've hidden old love letter written in Greek in my closet for the kids and grands to find when I'm dead. Let them wonder about that! Keenan, I have shivers from your story setup. And now I'm so worried about your Yup'ik boy. This sounds like a must-read. My own nagging inspiration (really an obsession) led me to interview 130 sewing professionals from five countries, in an epic long-distance phone process in 1993. 400 hours of interviews. I identified 70 different sewing specialties, including some crazy ones, like theater curtains (can take up an entire workroom), covers for kibble making machines (need to be replaced once a month because the vibration shreds them), clown costumes, and leather outfits for country singers. I couldn't not write that book. Wish I could find another topic that consumed me in that same way. Wow! You are my idol! What fascinating research! Maybe that's your calling? I just saw the Elizabeth Wein (Code Name Verity) published a non-fiction about WWII female pilots this week. I so admire fiction writers, but I am much happier writing nonfiction. Keenan, already you've made me care about Evan and Esther and I just have to find out the whole story! And like other commenters, don't get me started about my grandchildren! Thanks, Judi! I am so glad! Having people care about these two is really the goal of the whole story. Congratulations, Keenan! My copy of HEMLOCK NEEDLE showed up on release day and I can't wait to get to it! I've talked about my grandmother before, my dad's mom who was the inspiration for Betty Ahern in my short story "Home Front Homicide." She was a Rosie the Riveter, raised two boys and worked in the high school cafeteria. A take-no-nonsense lady, she died in 2001 and still looms large in my life. Thanks, Mary! I love your Betty Ahern. You grandma must have been a hoot! 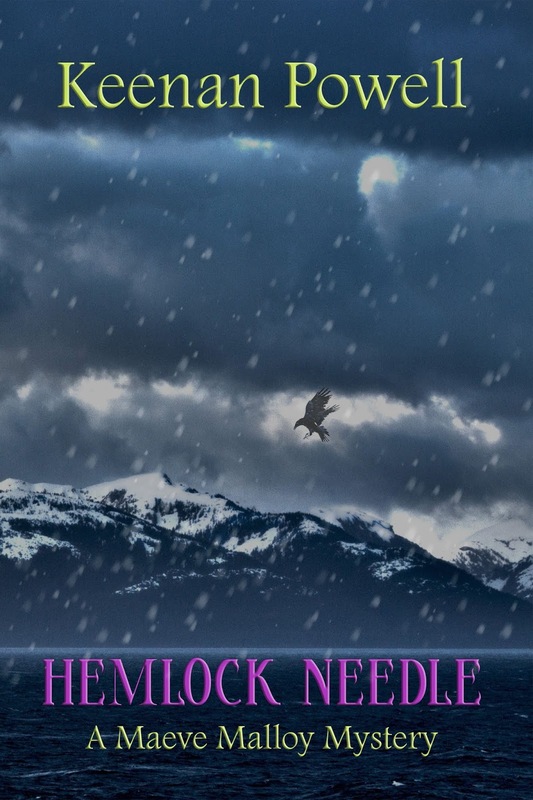 Keenan, I love stories that immerse me in a different culture with respect and honesty--sounds like I need to find a copy of Hemlock Needle (and as an auntie to 9 little boys over the years, my heart is constricted at the fate of Esther and Evan!). Just doing some paper sorting the other morning and came across letters from my two grandmothers--reading those was like having a conversation with them again. Thanks,Flora! Aw, that is such a nice story about finding those letters. Years after my grandmother (who I named my protagonist after) died, I got a package in the mail from her with her handwriting on it. She had asked someone to mail it for her, they forgot and by the time they had, I moved, it was returned and then they mailed it again. I cried. I'm a HUGE Maeve Malloy fan, and I can't wait to dig into HEMLOCK NEEDLE. Congratulations! Hmmm, image that inspired... I once read a news article about a woman who found a bullet in a piece of pork she was preparing for dinner. That inspired lots of what-ifs. Lately I'm inspired by that new creepy Facebook app that watches you move around your house. Thanks so much, Hallie! I like that bullet story. And I have to check out that app. Possibilities are multiplying furiously in my head even as I type this! And PS Brady is one handsome dude. Thank you. He is, isn't he? The little girls flock to him and those curly black eyelashes. Image that nags me: a baby, bundled up in a winter coat, sitting and crying at the water's edge as the tide recedes, next to a prone woman who might be his mother and is probably dead. The seagulls arrive. Thanks, Margaret. You're on to something -- that image is horrifying. Keenan, your description painted such a vivid image in my head that I can hardly wait to read the book! I was only close to one of my grandmothers, Bessie Akers. Born in 1899, I marvel at all she saw in her lifetime. Her family were poor farmers in south with no electricity or indoor plumbing. She lived through the development of flight, the Titanic, the Great Depression, two world wars, the Space Age, and the Cold War. Can you image?! Thanks, Cathy! It is amazing what that generation saw. My own grandma who I named Maeve after was born in 1891 and lived 100 years. From a time when she was only allowed to major in home economics and she couldn't get into medical school because she was a woman, she was told (I later learned that a few women did go) up through encouraging me to go to law school and see me graduate and my sister because an aeromechanical engineer. Plus all the technological advancements. It makes my mind whirl. I don't know how I've missed your books until now, Keenan, but will be adding them to my list today! I am fascinated by the cultural complexity of the Alaska narratives I've read. I'm sometimes surprised by how much I'm reminded of life in communities in rural Western Africa with strong family networks providing support, complication and creativity in managing daily life. I love finding stories in images or from images. I'm currently looking at a photo of the camel guide who spent a night last fall guiding my family into the Sahara. Trip of a lifetime for me. Average day at the office for him. Thanks, Lysa! You're so right: Alaska is a complex place. How intriguing: a day at the office on the back of a camel in the Sahara. That must have been an amazing trip. Keenan, HEMLOCK NEEDLE sounds fascinating, and I know what you mean by the power of a single image. I once stumbled over a small graveyard near an Adirondack area reservoir while out walking with a friend. It had multiple headstones for children, many of whom died within a few weeks of one another. The sight was powerful enough to fuel my third novel. Thanks, Julia! The image you described is so heartbreaking -- I can see how telling a story about it could be healing. How wonderful that you have so much personal experience to draw from. There are many images that have stuck with me before. I won't go into details, but one was a pretty disturbing photograph I stumbled upon online while doing research for a book. I suppose that's one of the hazards of Google searches for us mystery writers. Thanks, Marla! Having practiced criminal defense and personal injury law, there are images in my mind that are better left unshared. They don't go away and I wouldn't want to burden another with them. I get it. Sorry to late to the party! I had to run into Dallas first thing. Keenan, should I start with the first book? Thanks, Deb and thanks for hosting me today. It's been a hoot! You don't have to start with the first book. Like your series, there is an overarching plot arc but I think I explained it enough in the second book that you would be fine reading them in order or out of. Alaska has to be a huge source of inspiration for stories. As for grandmas, I've talked about my maternal one before: Texas lady, could plow with mules as needed, killed snakes with a garden hoe, cooked meals for everyone who showed up, and as I found out years later, was supremely lacking in self confidence. She was always concerned about what the neighbors would think. As for my paternal grandmother, I wasn't close to her. Part of that was geography. She raised her family, 4 boys, very strictly, or at least tried to. My dad was the youngest, born in 1919. I remember her trying to get my older brother to promise not to smoke; he was maybe 8 at the time? She seemed to save her warmth for everyone but family. When she died so many people sang her praises about her being a warm and caring person. With family she seemed to be all about rules. Thanks, Pat D for sharing your stories. Both of your grandmothers sound like incredible women, each in their own way. I wonder if your paternal grandmother felt like she was the one who had to lay down the law. The early 20th century was a tough time to raise a family, for sure. I love certain settings and get comfortable in reading books with them, knowing my comfort zone will, well, give me comfort and pleasure. But, I am also willing to step outside of that comfort zone and try a new setting. I hadn't read an Australian setting since The Thorne Birds when I tried Jane Harper's The Dry in 2017, I was captivated with Australia. And now, Keenan, you're bringing Alaska to my attention, and I'm thinking this would be a good visit outside of that comfort zone of mine, too. I admit, too, that Alaska has been in my thoughts before as somewhere fascinating to visit. What draws me in especially about Hemlock Needle is the cultural richness at its core. Reading it won't just be a visit to Alaska, but it will be an introduction to the heart of a place, and, of course, a cracking good mystery awaits me, too. Thanks for visiting the Reds today, Keenan, and adding to my anticipated stories list. Thanks, Kathy, for your kind remarks. 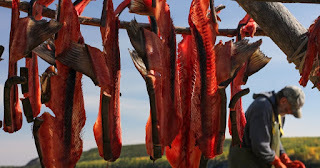 Alaska does have a rich culture and I'm hopeful it will be preserved as we go forward. Your book sounds like a fascinating read. We were travelling some years back and stayed in Sapa, in the northwest of Vietnam. The hiking was beautiful and the hill tribes in the area made for a an exciting trip. It is a market town and plenty of crafts were being sold. On one of our hikes we came across a young girl who looked like she might be 8 or 9 years old. She was doing cross stitch to decorate a piece of the locally made cloth. The striking thing for me was that she was riding a water buffalo at the time, as well as, watching over a few playing children younger than herself. She managed to do this on mountainous terrain, no less. I did not do anything with the image/memory than keep it. Thanks, Lil! What a wonderful image! What a talented kid. I couldn't help but stab myself doing cross-stitch sitting in front of the TV. And then the holes got smaller, so I quit. Your book sounds interesting. My maternal grandma was very crafty. She made me and my doll identical nightgowns with a flower embroidered on. Grandma could buy something at a bazaar and take it apart and figure how to make one like it. Myself I avoid taking things apart because I can't get them back together. Grandma knitted or crocheted a stole out of angora wool that looked like mink. I was there for my week in the summer and kept petting it while she was making it. Thanks, Sally! Your grandma sounds like a very special person. Mine made a dress for me for my first birthday that was oversized (more room to grow). I felt like a princess. I know this is a non-responsive response, but I am so interested in reading your book because my niece has begun to work in the Emergency Department of a Native Hospital in Anchorage. She relates to me what she is learning about native culture, and it is fascinating to me. So different than the Southern Californian culture where I grew up. She encounters some difficulties as an outsider, but I think she finds more difficulties in dealing with and understanding corporate hospital culture. As to ideas I can't get out of my head, I make them into small quilts. The challenge is simply to give myself the time to do it, to prioritize making those art quilts over making something "practical". Thanks, Beth! Your niece must be a special person; that can be heartbreaking work. I used to quilt too but became frustrated when I couldn't find the color I wanted so I switched to painting. All my bed/couch size quilts have long since disintegrated but I still have some of the wall hangings. And the machines which I keep just in case. Thanks,Linda! What a treat that must have been for you. The first time I flew over Ireland, my ancestor's home, I cried. Somehow I didn't think it would be there or look like how I pictured it. But, sure enough, there were forty shades of green. Thanks, Ellen! Your series is very painterly, if you don't mind me saying. I have a very clear idea of how everything looks: the Crozat home, Pelican, the antebellum dress Maggie has to wear, her classic little drop top, the Mardi Gras costumes, on and on. Go, Keenan! I am a big fan of Maeve - so looking forward to this next read. To your question, an image that, for some reason, struck me and stayed in my mind - a deserted schoolyard next to a shuttered parochial school that I drove by one day. I envisioned an old nun walking across the schoolyard in winter dusk. Couldn’t get the image out of my mind - so, of course, I had to write about it. Opening scene in my first mystery The Immaculate. Your experience with the photograph that inspired Evan and Esther resonates with me! Thanks, Marian! How haunting that image you describe is! Now that you honored the muse, did the image fade away so you could welcome inspiration for your next book? Or did it just flow from book 1? Thanks, Reds, for hosting me. Karen in Ohio is the winner of this giveaway. Karen, please send me an e-mail: Keenan@gci.net.